Drew and I went to the zoo this weekend with a friend and together we slowly admired all the animals present. At least I think there were animals there. I was so busy nervously watching Drew roll around on his monster truck amongst the foot traffic, steep slopes and sharp turns or heavily panting from lugging him around when he got too tired. Oh, did I mention that I was also pushing around a nice, comfy stroller that Drew rode in for maybe a combined 10 minutes? Oh yeah. Although it did make a nifty cart to carry all of our loose items. I had definitely anticipated Drew maybe wanting to walk instead of being pushed around on the stroller considering how much more independent he is growing lately. Thankfully, I had thought to bring his monster truck along for the ride hoping it might appease his desire for independence and appease our desire to proceed through the zoo at a reasonable pace. Funny story: Drew let go of his truck while we were huffing and puffing up a steep hill towards the entrance and off it took down the hill flying much faster than I’d seen that truck go before. It’s eventual destination? A lake. I couldn’t let Drew’s favorite truck sink, so off like a road runner I took down the hill after it. As I ran after it, I carefully planned my attack: Don’t bend over and try to grab it – you are running full speed, you’ll likely lose center of balance and fall face first into the concrete and if you don’t fall, you’ll lose momentum and the truck is history. Should I kick it? The truck has been through so much already – the side panel is broken, it’s already covered in duct tape to cover sharp edges, it’s missing pieces, and the buttons no longer work. I decided to kick it and it tumbled on its side 2-3 times. By the time it was all said and done, I was at the bottom of the hill and now I had to reclimb the hill, this time with in full-blown hyperventilating panting and wobbly legs from the sudden rush of work. 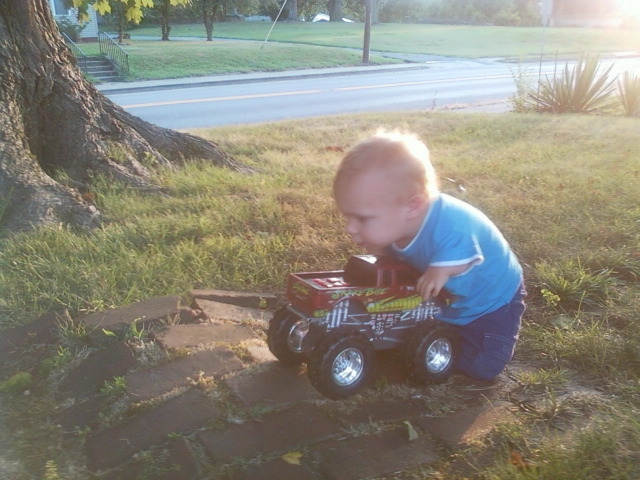 But, Drew was pleased to have his truck back. I couldn’t get to the top of the hill where an empty bench was perched fast enough. Ugh. Great save Mom, hope you had your running shoes on!!! Know you absolutely provided another wonderful adventure for Drew, the day couldn’t have been more beautiful. 🙂 Love!